It is said that when someone is destined to succeed, all the forces of nature conspire to usher them to their success. The Mughals (Moghuls, or Moguls) were destined to succeed in establishing their rule over India, and a series of events led them to their destiny. Prior to the advent of the Mughals, India was a sprinkling of independent kingdoms governed by Muslim and Hindu rulers alike. There were the Afghan kings ruling Delhi, Gujarat, and Bengal, the Bahamani kingdom of the Deccan, and further south was the formidable Hindu kingdom of Vijaynagar ruling Andhra, Karnataka, Tamil Nadu, and parts of Kerala. Even further was the Hindu zamorin of Kerala. Standing face to face against the Delhi sultanate was the loose confederacy of the Hindu Rajput clans, led by Rana Sangha of Mewar. The Mughals belonged to a Turko-Mongoloid race, offspring of inter-tribal wars and an intermixing of the various Central Asian tribes. They had a Turkish physiognomy, and very distinct mongoloid features. They were a belligerent lot, but excellent horse riders. Their descent was said to be from Timur the Great (Tamerlane, founder of the eastern Persian Timurid dynasty), and Chagatai khan, son of Genghis Khan. Babar was the first Mughal to invade India, somewhere in the region of 1519. 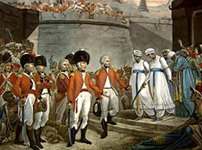 With some remarkable military conquests he succeeded in defeating more powerful foes such as the Afghan Lodhis of Delhi and the valorous Rajputs of Rajputana. By 1530, Babar had succeeded in capturing half of northern India. His son, Humayun, continued his battle against the Afghans. His most formidable foe was the Afghan, Sher Shah Suri (1540-1545), founder of the resurgent Suri dynasty in Delhi. Humayun had mixed luck in his life. He was to lose his lands, only to regain them later. He even lost Delhi to his foe, Sher Shah Suri, and only after the Afghan's death he could regain it back. Humayun didn't enjoy his renewed rule for long, though. He died in an accident in 1556 and was succeeded by his son Akbar. Akbar the Great, as he is popularly known, proved to be the most competent ruler in Mughal history. He expanded his rule to many corners of India. His most valuable contribution was the symbiosis that he established between the Hindus and the Muslims of the country. Akbar was considered to be a son of the soil, in comparison to his predecessors who were viewed more as foreigners. He married many Hindu princesses, forging alliances between kingdoms. Overall, he was considerably more tolerant to other faiths in comparison with his predecessors and descendents. 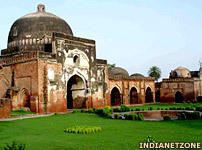 Akbar was succeeded by his son, Jehangir. He continued his father's policy of conquests but he is viewed in very contradictory terms by historians, a strange compound of tenderness and cruelty. He was said to be hedonistic and addicted to alcohol, and he alienated the Sikhs when he put to death their guru, Arjun Dev, for helping his rebellious son. However overall, Jehangir is viewed as a competent administrator and a patron of the arts. 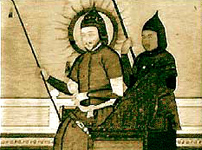 Jehangir was succeeded by his son, Shah Jehan. Shah Jehan increased the borders of his kingdom as far south as the Deccan plateau (present day Maharashtra). His greatest contribution to India was the magnificent mausoleum, the Taj Mahal, in memory of his wife, Mumtaz Mahal. His bejewelled peacock throne was also a source of great envy. Shah Jehan's son, Aurangzeb, succeeded him after imprisoning his father and murdering his brothers, including Dara Shaikoh, the eldest and favoured son of Shah Jehan. Aurangzeb was a Muslim zealot who ruthlessly suppressed his Hindu subjects. He introduced the much hated 'jaziya' tax on his Hindu subjects. There was mass proselytisation. Also in his lifetime ,he alienated many of his Hindu nobles, and faced many rebellions as a result. Despite all this, to his credit he was seen as a competent commander and a very able administrator. He was also a Muslim puritan who never touched alcohol, was a regular 'namaazi' and led a very simple lifestyle. He met his most irksome enemy in the Deccan, in the form of Shivaji, the Maratha king. To tackle Shivaji, in his later years Aurangzeb encamped himself in Maharashtra, but Shivaji remained elusive until his last breath. Shivaji's son, Sambhaji, carried on his father's struggle against Aurangzeb, but he was a victim of treachery and was captured. When they came face to face, Aurangzeb asked him to convert to Islam. When Sambhaji refused, he was said to have been put to death after some very cruel torture. There is still a city in Maharashtra, called Aurangabad, named after the Mughal emperor. Aurangzeb is said to have begun its construction. 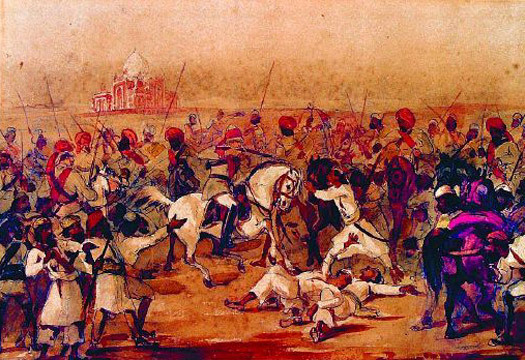 After Aurangzeb's death, the Mughal empire weakened. Though there remained Mughal emperors in Delhi until as late as the nineteenth century, they were a drastically weakened lot. By that time, the Rajputs, the Marathas, and then the British had superseded the power of the Mughal throne. The last Mughal emperor, Bahadur Shah Zafar (died 1862), was little more than a puppet in the hands of the British.